Owning a gun is one of the more important responsibilities you’ll ever take on in your lifetime. Used properly a firearm is fun to use at the range, can save your life, can deter harm to life and limb to yourself and others, and provides you with a sense of security that nothing else can. Improper use or display can get you killed or locked up for a considerable amount of time. Keep that balance in mind. While providing instruction to new shooters there are a number of aspects to consider that should be reviewed that will save you time and build your shooting confidence. Introduction to firearms training and classes show a new shooter what the mechanics of the gun are and how it is used safely. This is generally well covered. The legal aspects of use are covered in some detail but in my opinion, not enough. The reason is that the trainer is not an attorney and does not offer legal advice. AFI recommends that each beginner get and read the local handbook on gun law. In Florida for example there is the Florida Firearms – Law, Use & Ownership by Jon Gutmacher Esq which goes into all aspects of our gun laws in readable detail. And when you’ve finished reading it you’ll be glad you did, as without it you leave yourself very exposed to prosecution if for instance you don’t know that you cannot walk into a bank with a firearm or have one within 1,000 yards of a school. Shooting at the range and choice of a weapon. Second, how to choose a suitable handgun for themselves. Learn to shoot with a .22 cal pistol. Over time fire a 1,000 shots, fire 5,000, fire until hitting a target accurately at a distance of 7 feet, 25 feet, 50 feet becomes instinctive. The three rules of successful gun handling? Practice, practice, practice. Practice ingrains good habits that should have been taught to you by your teacher so that you can react predictably in a stressful situation. Remember, when the time comes to use your firearm in real life, you’re on you own. Learn to fire using triple taps. I was taught that two to the chest and one to the head was the best way of doing it given a straight on opportunity. I was also taught to keep shooting until the attacker went down even if that means emptying your firearm. Reload immediately. Choosing a caliber you’re comfortable with. As you progress in developing your shooting skills and confidence, investigate a larger caliber weapon that you are comfortable with. There’s no rush.On rim-fire ammunition (.22 cal), the firing pin crimps the side of the cartridge to ignite it. Center-fire ammunition has a disc in the center of the round which, when struck by the firing pin, fires the round. 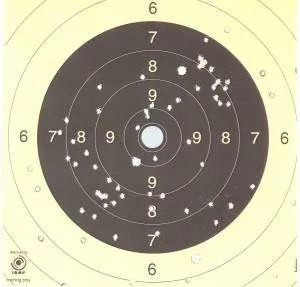 Center fire ammunition starts with the .25 caliber round and upward.I suggest that you start with .32 cal, move to a 9mm, a .357 (now there’s a cannon), then a.38, and a .45. You’ll find out very quickly which round you’re comfortable firing for recoil and accuracy.A confident shooter firing a .22 is far more dangerous than a nervous one with a .45. And despite words to the contrary, .22’s can kill and kill quickly, if you hit the attacker in the right place – the head. That’s why the Israeli Mossad at times uses .22 cal pistols. Little recoil, larger magazine capacity, it’s a small and light firearm that shoot’s accurately. ‘Stopping power’ is a myth. According to FBI research, available under the Reports Section of the site, if you’re attacked there is no type of ammunition that is going to save you although larger rounds do more damage. Sure you’ll kill the attacker with a smattering of torso shots. Eventually. A head shot kills instantly.There are reports of drug crazed attackers absorbing 10 or more torso rounds when shot by the police before being brought down – there’s one report of 18 shots being fired to get the criminal down.There is a huge difference between an instant kill and a kill that takes time even if that time is counted in seconds. In a gunfight, seconds are eternities. For example, if the attacker is jacked up on drugs even a direct shot to the heart may take upward of 10 seconds to put him or her down. That’s because the brain has a reserve of oxygen that lasts long after the blood flow slows and drugs keep the brain working long after a blood pressure drop that should stop it functioning. And they can kill you in that time. The key to stopping power is not caliber or weapon type, its shot placement. A headshot, above the nose, is guaranteed to put their lights out immediately. Our brains have an instant off switch when hit by a high-speed projectile. And that’s just about the only instant kill you’ll get. Your attacker will fall like a bag of rocks. Or, failing that, a shot to the upper neck from behind, which have a similar effect. Find out which type of pistol you like. You have two choices: semi-automatic or revolver.Revolvers are simplest to use, just point and pull the trigger. Semi autos require working the slide to push a round into the breech, and disengaging the safety. They can sometimes be prone to jamming. If you follow the three rules and practice, practice, practice, arming the weapon or clearing a jam will become second nature.Do your own research before going to shop for a firearm. Once in the store ask the salesperson about your preferences for gun style, size (Compact, Mid-size and Large), weight, caliber, ammunition capacity, size and, above all, reliability. And when you purchase, practice with your personal firearm a lot. Don’t be pushed into buying a larger pistol than you want and need!You can continue use a range rental .22 caliber pistol to plink away to maintain accuracy at a cheap rate but also fire some rounds each time you practice with your personal firearm. It should become an extension of you, instinctive to use and for that to happen you have to know it inside and out. One last note: Personal defense is personal. That one time you need to defend yourself, you’ll only have yourself to rely on. Make sure you’ve taken the time to make the right choices to shoot confidently, safely and comfortably. And if you have an opening to avoid a fight, take it and run.